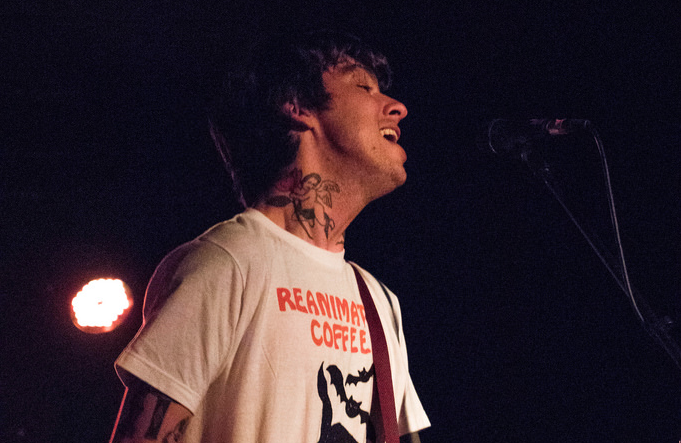 Friday night, three buzzworthy melodic punk bands played in Lawrence as one of the final stops on their nationwide tour. Joyce Manor's young, passionate fans piled on top of each other at the front of the stage to sing along to every relatable, angst-fueled lyric. The tightly-packed floor only stopped jumping and headbanging during the breaks between songs. Co-headliners Wavves played to a crowd filled with dedicated fans. A few songs from their hour-long set, including fan favorite "Green Eyes," were performed at much speedier tempos than on record. The audience reflected the band's pace with a slamming mosh pit and a crowd surfer or two. The band managed to let loose and interact with the crowd, despite singer/guitarist Nathan Williams saying he had just been throwing up in the back alley before they started their set. Culture Abuse kicked off the night with their first ever show in Kansas. Fuzzy vocal effects along with a separate mic for echoed vocals made for a unique twist on their otherwise straightforward punk rock.